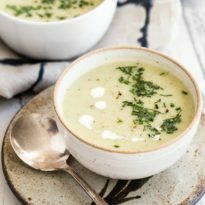 As cozy as it is comforting, Potato Leek Soup is just the remedy for a cold, dreary day. Leeks and garlic add a subtle layer of flavor to the earthy and noble potato. My recipe keeps things simple, so all you need is a few easily-sourced ingredients, a little time, and your favorite mystery novel while the soup cooks. While Spring may be around the corner, this soup makes it easy to hibernate for one more day. Trim and discard root and dark green parts, reserving white and light green parts. Split lengthwise and wash well to remove sand and grit. Thinly slice. In a Dutch oven or large saucepan, melt butter until foaming. Add leeks and and soften without browning, about 3 to 5 minutes. Stir in garlic until fragrant, about 30 seconds. Add broth, potatoes, bay leaf, 1 teaspoon salt, and 1/2 teaspoon pepper and bring to a simmer. Simmer until leeks and potatoes are tender, about 30 minutes. Remove bay leaf. Using an immersion or regular blender, puree soup until smooth. Return to pot and stir in cream. Season to taste with salt and pepper. Serve hot garnished with chives.